Cindy describes herself as a fabriholic because she loves all types of fabric and styles. She appreciates the touch and feel of fabric. 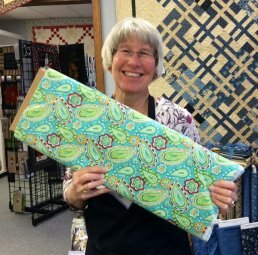 Because of her extensive background of sewing, quilting and crafting, she’s our go-to person when we have questions we can’t answer. She loves helping people build quilts and she’s great at calculating yardage. We love Cindy and we’re so glad she’s a part of our team!